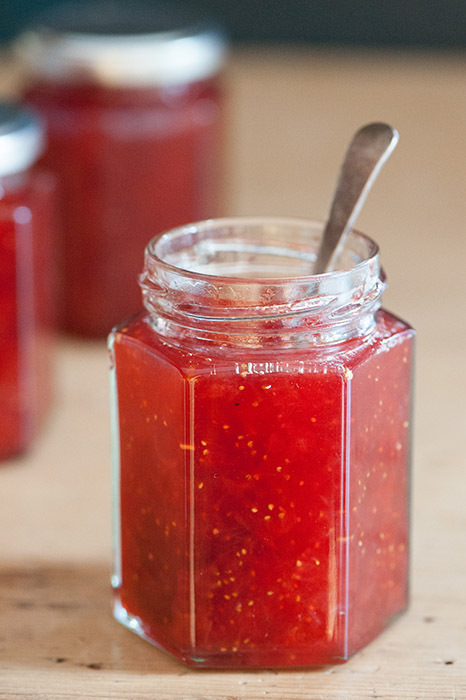 This is the fastest and easiest way I know to make a bright red, fresh-tasting strawberry jam, and I sterilise my jars at the same time! I always use freshly squeezed lemon juice and slightly under-ripe strawberries to achieve a good ‘set’ – they help to make the jam thick and spreadable rather than runny. Choose organic ingredients for excellent vibrant flavour. Rinse with water 2 x 250 ml clean glass jars and their lids, place jars upside down in Varoma dish with lids arranged around them, then cover with Varoma lid and set aside. Coarsely chop strawberries 2 sec/speed 4. Add sugar and lemon juice, set Varoma in position on TM lid, then cook 17 min/Varoma/speed 1/reverse. Set Varoma aside on a plate then test jam for setting point: stand TM bowl on countertop and tip it so jam goes approximately halfway up shiny inside of TM bowl, then stand it up again – if jam liquid and a few strawberry pieces stick to TM bowl above the surface of the jam, it is at setting point (see gallery photos below). If jam is thin and runs cleanly down inside of TM bowl, cook again 2 min/Varoma/speed 1. Touching only the outsides of the steam-sterilised glass jars and lids, carefully place jars on countertop, pour jam into them and close with lids. Set aside overnight for jam to thicken and set. 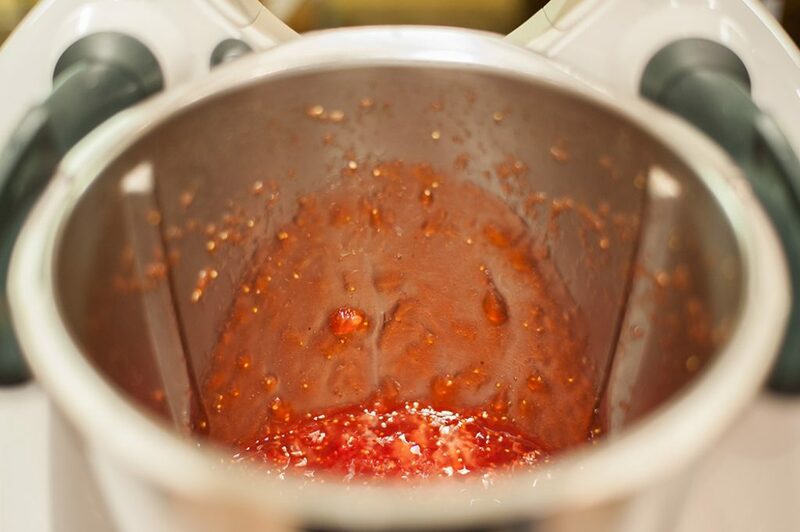 These quantities are perfect for making strawberry jam in your Thermomix – do not double this recipe in Thermomix as it may boil over. Once opened, keep in fridge and use within 3 weeks. Perfect in a Victoria sponge cake, stirred into yoghurt, or spread on top of buttered toast. 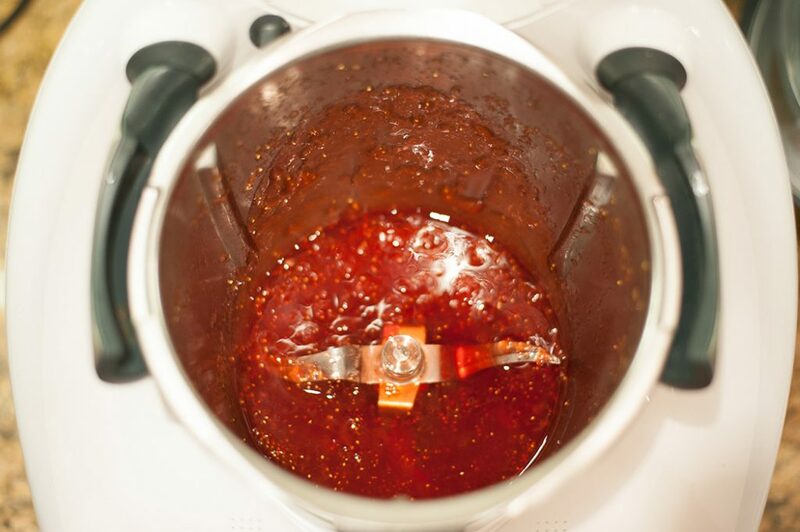 Warm strawberry jam is a lovely sauce for ice cream.